I love this photo that I purchased recently for a mere $5. It appears to date between 1880 and 1890 and is becoming heavily foxed. 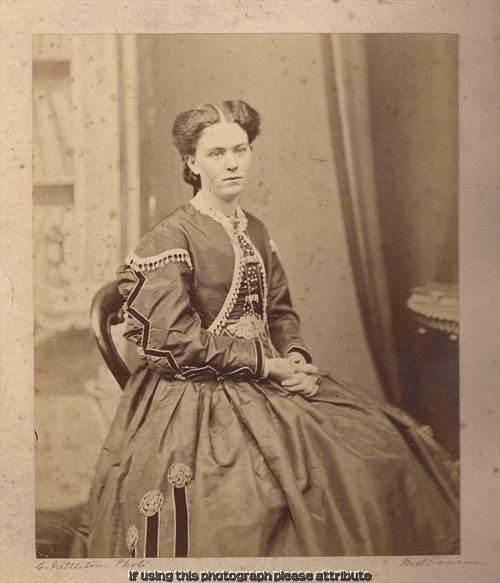 I don't normally purchase photos of subjects outside of New Zealand unless they tie back to my own genealogy, however the sad and detached stare of this young woman and her unusual dress just drew me to her. He photographed the troops sent to the Maori war in 1860, the artillery camp at Sunbury in 1866 as well as contingents for the Sudan campaign and the Boxer rising. The sharp delineation of his pictures taken at six seconds exposure was a credit to his skill. Nettleton visited the goldfields and country towns, photographed forests and fern glades, and rushed to disaster areas. In 1861 he boarded the Great Britain to take pictures of the first English cricket team to come to Australia. During the Victorian visit of the Duke of Edinburgh in 1867 he was appointed official photographer. He was police photographer for over twenty-five years and his portrait of Ned Kelly, of which one print is still extant, is claimed to be the only genuine photograph of the outlaw. Nettleton had opened his own studio in 1858. His souvenir albums were the first of the type to be offered to the public. However, when the dry-plate came into general use in 1885 he knew that the new process offered opportunities that were beyond his scope. Five years later his studio was closed. His work had won recognition abroad. His first success was at the London Exhibition of 1862 and in 1867 he was honoured in Paris. He was not a great artist but a master technician. Nettleton was an active member of the Collingwood Lodge of Freemasons and a match-winning player of the West Melbourne Bowling Club. Aged 76 he died on 4 January 1902, survived by his wife, seven daughters and three sons. Australians behind the camera, directory of early Australian photographers, 1841-1945 / Sandy Barrie, 2002.